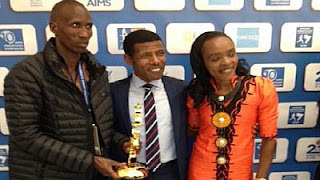 Haile Gebrselassie, Ethiopia’s athletics great, has been given the Lifetime Achievement Award from the Association of International Marathons and Distance Races (AIMS). Haile – who is the new President of the Athletics Federation – received his award at an event organized on Friday in the Greek capital, Athens. “What an honor to receive the AIMS Lifetime Achievement Award in Athens tonight, thank you!” Haile tweeted after the award. We are honoured to be able to recognise the achievements of Haile Gebrselassie and his unrivaled contribution to the Marathon Movement and world sport. AIMS has previously presented Haile with the AIMS World Athlete of the Year Award for three consecutive years between 2006 and 2008. Gebrselassie, has brought the country a lot of glory in long-distance events had a stellar career which spanned over two decades, since 1992 when he won the 5000m and 10,000m titles at the World Junior Championships.